MINNEAPOLIS — Picture this: Prince taking the stage at U.S. Bank Stadium in his hometown of Minneapolis for the 2018 Super Bowl to a dazzling display of purple lights, wowing the crowd at halftime with his frenzied guitar work, soulful singing and slick dance moves. Perfect marketing, a die-hard fan’s dream. But it won’t happen. Prince’s death from an accidental painkiller overdose in 2016 leaves fans to only imagine how the megastar might have topped his electrifying performance in pouring rain at the Super Bowl 11 years ago in Miami. “People joke, `Can we just have a Prince hologram?’” said Mike Howard, spokesman for the Minnesota Super Bowl Host Committee. Justin Timberlake is the halftime performer for Sunday’s game. At a press conference Thursday, Timberlake said Prince was a big influence. But the sights and sounds of Prince still surround the big game between the Philadelphia Eagles and the New England Patriots. 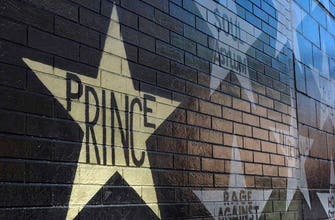 There’s the mural of Prince with a white dove in the Uptown neighborhood, his gold star outside Minneapolis’ First Avenue nightclub, or Paisley Park, his recording complex-turned-museum in Chanhassen, about 20 miles (32 kilometers) southwest of Minneapolis. Thousands packed downtown for Monday’s “Prince Night” concert, featuring Sheila E., Morris Day and The Time, and Prince’s 1980s band The Revolution. Fans also are getting a firsthand look at Prince’s guitars, costumes, hats and shoes on loan from Paisley Park at an exhibit as part of Super Bowl Live. “He was magic. I think that people in Minnesota didn’t realize exactly how big he was probably until after his death, because he was our hometown guy,” Jeanette Blasewitz, 66, of Eden Prairie said while checking out the displays. Sunday’s game marks the anniversary of Prince’s appearance at the 2007 Super Bowl that saw the Indianapolis Colts beat the Chicago Bears. Many called the show the best Super Bowl halftime ever. Dressed in turquoise jacket and pants with an orange shirt, Prince gave a blistering rendition of his own hits, such as “Let’s Go Crazy,” followed by covers of Creedence Clearwater Revival’s “Proud Mary,” Bob Dylan’s “All Along the Watchtower” and the Foo Fighters’ “Best of You” before finishing with “Purple Rain” in a driving rainstorm. Morris Hayes, 55, was a keyboardist for Prince’s former band New Power Generation and was on stage that night. He remembers organizers approaching Prince before the Super Bowl with the forecast of rain and offering to pre-record his performance. Hayes said that prompted Prince’s famous response: Can you make it rain harder? “The fact that it did rain when it did and how (Prince) did `Purple Rain’ in the rain, you can’t beat that. … It was magical, you know,” Hayes recalled. Fan Melisa Rokala, 46, of Cokato explains Prince’s appeal to Minnesota residents. She believes Prince — who once wrote a song for the Minnesota Vikings — would have been involved in a Minneapolis Super Bowl, perhaps again as the halftime performer, if he was still alive. The Super 8 Hitting System – Does It Work?